Lancashire is still a relatively unknown county, probably because its traditional image has discouraged visitors. However, since the boundary changes of 1974 it has become a predominantly rural county, though it still possesses significant memorials of the industrial revolution, which Lancashire people helped to create. Two canals, two Georgian ports, a number of fine mills with chimneys, a network of railways with imposing viaducts, steam engines and working museums now recall the story of the cotton industry. With industry came seaside holidays, and the coastal resorts of Lancashire cater well for all tastes. The inland areas, too, offer much to the visitor, from quiet villages and country churches to bustling markets, good shops, fine museums and historic buildings. The countryside shows a similar variety, with the limestone pavements near Silverdale, the former fenland on the western plain, the beautiful valleys of the Ribble, Hodder and Lune, and the open fells of Rossendale and Bowland, culminating in the majesty of Pendle Hill. All this and more — plus a friendly welcome — awaits the visitor, and this book is an introduction to the best. John Champness was brought up in London but is married to a Lancastrian and his two children were born in the county. He has lived in Lancaster for twelve years and worked for the county council for fourteen, latterly as its Conservation Officer. 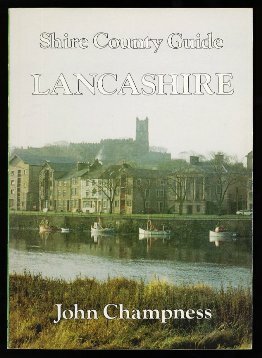 Believing strongly that his adopted county deserves to be better known, both to visitors and to local people, he has published a town trail to Lancaster and written and lectured on most aspects of Lancashire's architectural heritage. These are a new series of guides which present in a handy format a concise but comprehensive survey of a county area, its geography, history, architecture and tourist attractions. Each guide contains a gazetteer of towns and villages, and other topics covered include archaeology, churches, historic houses and the countryside. Visitors and local residents alike will find Shire County Guides invaluable and easily consulted sources of useful and interesting information, whether planning a day out or just reading for pleasure.